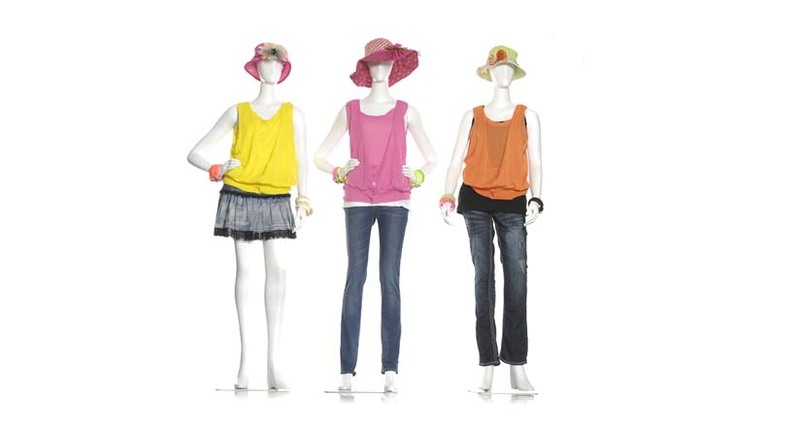 Using a small group of mannequins to display the hottest styles in clothing makes more impact than a single mannequin. Here are some creative ways to use mannequins together to sell more merchandise. Groups of two. Inspire your shoppers to give a gift by using two mannequins to display contrasting outfits. Keep one simple and accessorize the other to up-sell jewelry, scarves, jackets, or hats. Layers are a hot trend for both men and women, so show off how versatile the clothing can be by including layered colors and contrasting fabrics. If you carry both menswear and women's clothing, set up a male and female mannequin with your highest price items. Groups of three. A group of three looks balanced to the eye. Open up a space in your display area and make a scene with three mannequins dressed for a night on the town or a day in the park. You can get as creative as you like with this type of grouping. Groups of four or more. A large group of mannequins is perfect for a window display to bring customers into the store. If you sell clothes that appeal to all ages, set up a family. If you sell formal wear, set up bride and groom mannequins flanked by attendants. Using different height mannequins keeps all parts of your display in view.